Since coming back to work from the Christmas holidays (and having a nasty cold) I have been a walking corpse in the office, a horrific shadow of my former self. That's right, I've been a zombie worker drone scaring my colleagues with my vacant stare and sporadic moaning. I have been groaning the word "b-r-a-i-n-s" as I wander haplessly through the office. This is not because I want to eat one, but rather because I am calling out for my own brain, lamenting the absence of that lovely clump of gray matter that used to inhabit my skull and that once provided me with hours of entertainment. The first symptom was my tendency to wander somewhere and forget mid stride were I was going. My lack of brains really became apparent during one of those cringe worthy moments where I temporarily forgot the name of someone I have worked with for ages, and when I was called out on it I couldn't come up with one of my usual clever recoveries.... aaaargh b-r-a-i-n-s! 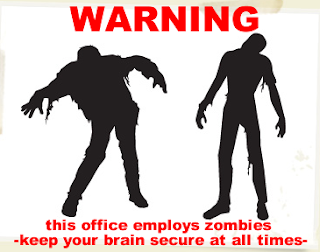 Being the walking brainless dead at the office has it's upswing of course, as everyone has low expectations of you . Also, I suspect many of my colleagues are in a somewhat undead state as well, experiencing their own post-holiday state of zombification. After mustering up some reserve brain power this morning in order to complete some paper work, my remaining grey matter finally collapsed and I was left with no other choice but to retire for the day back to my zombie den. Also, children tend to be scared of zombies, and an undead social worker is even more frightening, so I had no choice but to leave for the day. Hopefully someone will develop a serum to reverse my condition. 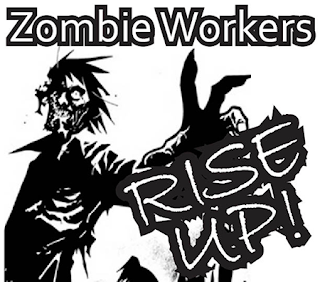 Any zombie moments for you at work this week? I share your pain old fiend. I started a new job on Monday too so I had to fake it with a smile on a face although I am not sure anyone bought it. I am getting there though just in time for the weekend. Lib - at least Zombies are immune to the cold, that might help. Hope things warm up for you! You have no idea how hungry this post has made me! Join us, Matthew, join us! It really was a long week, eh? I can't believe my weekend is over already and it all starts again tomorrow. January is just one of those months that always makes me grumble. Thankfully there is good music to listen to!